Twenty six disabled veterans with permanent disabilities, visual impairments or PTSD were matched with volunteer anglers (through CT Bass Nation) to enjoy a day of friendly and fun fishing competition today on the Connecticut River starting at Riverside Park in Hartford, Connecticut. 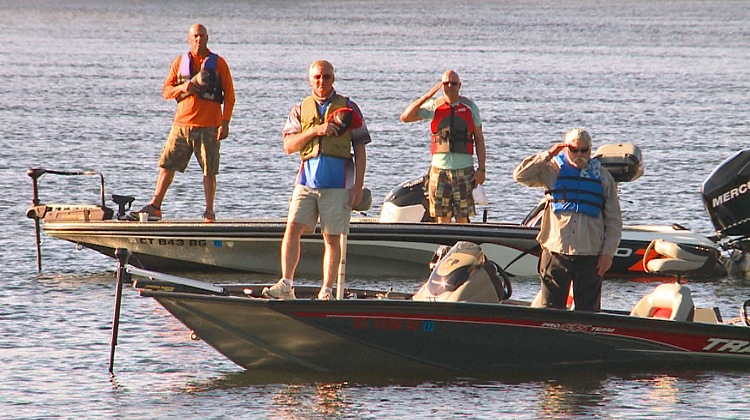 Here, members of the fishing flotilla give their respect while the national anthem plays. This was part of Gaylord Hospital SAVES (Sports Association Veterans Events Series) Tournament of Champions Fishing Tournament program. This is the 5th year that the tournament has been done.